Suffolk County Crime Stoppers and the Suffolk County Police Sixth Precinct Crime Section are seeking the public’s assistance in identifying and locating two men who stole assorted merchandise from a Farmingville CVS. 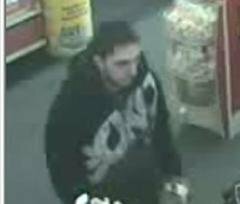 Farmingville, NY - March 12, 2015 - Suffolk County Crime Stoppers and the Suffolk County Police Sixth Precinct Crime Section are seeking the public’s assistance in identifying and locating two men who stole assorted merchandise from a Farmingville CVS. On Monday, March 2, 2015 at approximately 10:30 a.m., two men entered the CVS, located at 935 Horseblock Road in Farmingville, and stole more than $400 in assorted merchandise. The men fled in a black Volkswagen. One man is described as a black male with a thin build. He was wearing a dark coat, tan-colored pants and black and white sneakers. The other suspect is described as a white male with a thin build. He was wearing a black hooded sweatshirt with white lettering on the front. Subject: LongIsland.com - Your Name sent you Article details of "Suffolk Police Looking for Two Men Who Stole from Farmingville CVS"